Here's an affordable climbing helmet that gives you everything you need without breaking the bank! It has many common features, including a ratcheting 6-point suspension, built-in rain trough and a padded chin strap. It will also work with most common ear muffs on the market. While this helmet keeps the cost down, it doesn't compromise on safety. It Meets ANSI Z89.1-2009 Requirements Type 1 Class E, G, and C.
Is This helmet a Class 1 CSA Type E? What size is this helmet? 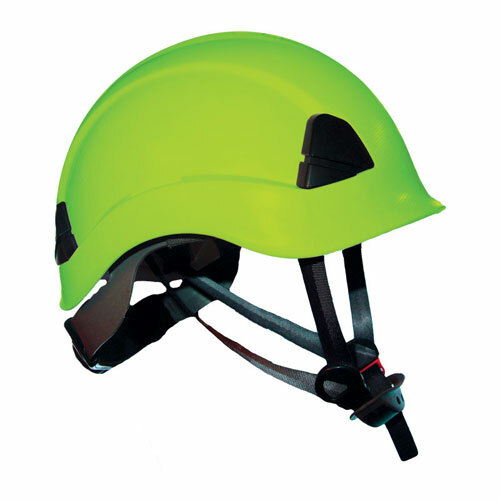 This helmet passes the ANSI Z89.1-2009 requirements for a Type 1 helmet with a class E,C and G rating. The inner suspension is adjustable and fits most users.